market in 1929 and has never reclaimed it's former glory, Sevilla is still called the Duende- or soul- of Spain and is known to have a certain ambiance. The first place I wanted to visit was the Cathedral, which closed at six. I wanted to get there as quickly as possible so I took a cab directly to it. It is the biggest Gothic church in the world and the 3rd largest church in Europe. It used to be the site of a mosque, but it was torn down in 1401 and the new cathedral was built in its place. I may be biased, but again, I was blown away by the sheer size of it and the intricate carving and architecture. With my handy dandy Rick Steves book at my side, I took a tour of the cathedral. I was quite upset to see that the main alter was undergoing renovations as it's supposed to be the largest alter EVER built in the world. Even the sheet covering the alter and displaying a picture of it was overwhelming. But then I moved on and had the opportunity to see Christopher Columbus' tomb, the most valuable crown in Spain, a piece of the cross and a spectacular view of Sevilla from top of the Giralda tower. There is also a very nice court of orange trees that was refreshing to rest in and one of the only remnants of the original mosque. The other is the tower, which made from Roman stones at the bottom for support, a Moor tower, and a Christian cap- accurately reflecting the history of the city. By the time I left the Cathedral, my neck and back were hurting from my heavy backpack. This combined with the heat, convinced me I should go check into my hotel. As always, it was hard to find, but I eventually made it by asking for directions along the way. I rested for a bit before heading out to grab a cappuccino at one of the bars near the cathedral. One thing I've found I love to do in Spain is sit out on the street at a cafe and people watch. Each place (going off of the 3 I've been to so far) has a different personality and it's really small things like this that make me feel like I'm really learning about Spain as a people and a culture. I even ended up conversing with the girl seated at the table next to mine, a French architecture student doing a semester abroad in Sevilla. I then headed off to take a "Paseo," or evening walk, in Barrio Santa Cruz, Sevilla's once thriving Jewish quarter. I walked through various plazas, found famous buildings, posed with a statue of Don Quixote, peeked in at the gardens of Alcazar, and eventually found my way to Plaza de la Santa Cruz, location of the flamenco show I was going to watch. If there is one thing Sevilla is famous for, it's Flamenco. I headed over to the Los Gallos club, getting there early to snag a good seat-which I did! Front row for me! There was a huge tour group behind me and I ended up talking to a very nice couple from Virginia before the show started. I wish I could have taken pictures, but photography and video were not allowed. I have to say watching flamenco is one of my best experiences of the trip so far and I literally left with a smile plastered to my face and an urge to start attempting the steps in the street. By the time the show had ended, it was around 10 p.m. and time for me to head back to the hotel. As always, I really really wanted to be out and about at night. 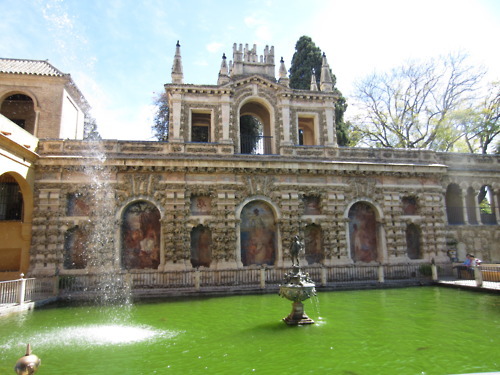 Seville has something in the air, that makes you want to linger outside and just take it all in. The next day I started the day with a hearty breakfast of toast with butter and marmelade, juice and coffe with milk at a cafe across from the cathedral. It took me awhile to find the Hospital de la Caridad. I eventually found it and plugged in an audio guide to explore. This is a Charity Hospital founded in the 17th century for helping the poor and needy. It had a very interesting church with pictures of death and an amazing altar with roman-themed carvings. Nowadays, it serves as a permanent home for the elderly. 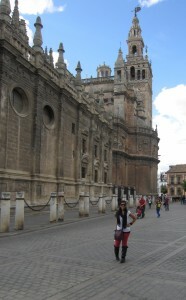 Afterwards, I headed towards the Guadalquivir River just to check it out. Looked at the Torre del Oro (Golden Tower), once the starting and ending point for all shipping to the New World. It's now a navel museum but I didn't go inside. I did note that there were people boating and kayaking in the river! Something to keep in mind for next time! I then turned around and headed back to the center of the city to go to Alcazar, a palace built in the 10th century and still functioning as a place for royalty. It is filled with Mudejar (Moorish) architecture and quite a sight to behold. On the outside, it looks like what you would expect a palace in Europe to look like, but on the inside, it reminded me of the palaces I saw in Jaipur, India. Alcazar is split into three different parts: The Admiral's Apartments, King Pedro the Cruel's Palace and the Gothic Wing. Each highlighted different parts of history. The Admiral's Apartment's had the oldest portrait of Columbus, King Pedro the Cruel's palace had a mixture of Mujaedar architecture with Christian motifs, and the Gothic Wing contained interesting tapestries and maps. More than the palace, the most exciting parts were the gardens! They were so extensive and so beautiful with trees, flowers, plants, fountains, details walkways and even a cafe! I spent the most time in the garden. 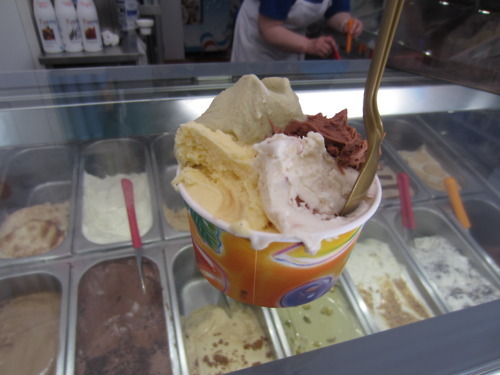 make sure I find Villar, a mom-and-pop ice cream place because it was amazing. I had to do it! So after about 30 minutes of searching, I ended up on a colorful street filled with cafes and restuarants. I spotted Villar and headed over. The ice cream is made fresh everyday and I was overwhelmed by the number of flavors. After discussing and tasting a few from the nice lady behind the counter, she told me she could put 4 flavors in one cup to help make my choices easier. PERFECT! I ended up getting chocolate mousse, pistachio, vanilla (apparently the most popular), and another spanish flavor I can't remember the name of (but started with an "M"). Super happy, I sat down and basically devoured it. The last thing on my list was to go to the Basilica de la Macarena, famous for the floats it has on display from Easter week and a statue of the Weeping Virgin (Mary). I needed to pick up my backpack from the hotel first because I was going to go directly to the bus station after that. The helpful receptionist told me I should take the public bus to the Basilica and I decided it sounded like a great plan because it was too far to walk to. I basically caught the bus just in time, paid the driver and sat down. As the bus started moving, I realized that I could not hear the station names clearly and also, I didn't know what stop to get off at! At one of the stops, I went up to the bus driver and told him where I wanted to go, and he was nice enough to tell me he would let me know when to get off. With his signal, I hopped off and tried to get a bearing of my surroundings. I didn't exactly know where I was in relation to the Basilica, and of course they didn't label the street I was on. So again with some help, I ended up in front of the Basilica. I FORGOT ABOUT THE SIESTA. The basilica was closed from 2-5 p.m.! Unfortunately my bus took off at 4:30 so there was no way I was going to see it. For next time I guess. 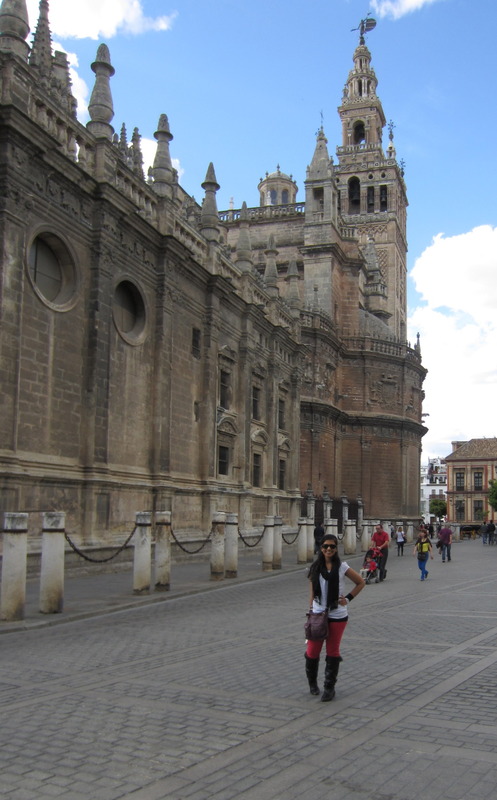 Sevilla is a city I definitely want to return to and experience fully. I can't describe what it is but the atmosphere is so summery and laid back, plus there is so much to see!